Carbon dioxide-related publications are available from CDIAC while supplies last. Please note: Several publications listed in prior versions of the catalog are no longer distributed by CDIAC. DOE personnel and DOE contractors should request those copies from the Office of Scientific and Technical Information (OSTI), P.O. Box 62, Oak Ridge, TN 37831 (http://www.osti.gov/). Other individuals may purchase copies from the National Technical Information Service (NTIS) (703-487-4650 or http://www.ntis.gov/) in microfiche or hard copy; prices will vary with the number of pages. 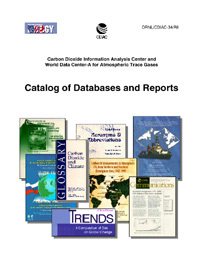 Currently in its eighth revision, the Catalog of Databases and Reports provides information about the many data products and reports available through CDIAC, including the DOE-sponsored research reports, CDIAC reports, CDIAC Numeric Data Packages (NDPs) and Computer Model Products (CMPs), and databases (DBs). The catalog, as well as many of the data products and reports listed in the catalog, are available online in enhanced format as HTML and/or PDF documents. As ocean CO2 measurements become steadily more accurate and investigators seek to evaluate very small changes in concentrations, the issue of how to calculate inorganic carbon speciation in seawater has become very important. Over the years there have been many determinations and reviews of the constants used to describe the dissociation of CO2 in the ocean, but no universally accepted set of constants exists. Several subtly different pH scales remain in common use, as do variations in the definition of total alkalinity (TA) and arguments over the relative merits of reporting the partial pressure (pCO2) versus the fugacity (fCO2) of CO2. Intended to be of general use and perhaps help to clear up some of this confusion, a recently released program, CO2SYS, performs calculations relating parameters of the carbon dioxide system in seawater and freshwater. CO2SYS uses any two of the four measurable parameters of the CO2 system to calculate the other two parameters at a set of input conditions (temperature and pressure) and a set of output conditions chosen by the user. CO2SYS replaces and extends upon a number of programs previously released. CO2SYS may be run on any 80 � 86 computer equipped with the DOS operating system in single-input mode or batch-input mode and has a variety of options for the various constants and parameters used. An on-screen information section is available that includes documentation on various topics relevant to the program. Each fiscal year, CDIAC staff reflect upon the data center's progress by producing an annual report that documents highlights from the year and goals for the coming year. 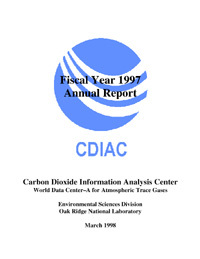 The Fiscal Year 1997 Annual Report provides information on new data products, publications, and additions to CDIAC's Web site and information on CDIAC's focus areas, and it provides statistics on the center's activities, such as the number of requests for global-change data and information, products requested, and citations in the published literature of data obtained from CDIAC. It also alerts users to new data products that CDIAC hopes to release in Fiscal Year 1998, lists awards received by CDIAC and publications and presentations of its staff, and names the many organizations with which CDIAC has collaborated to produce the data and information products it released in fiscal year 1997. Please note: Only a limited number of printed copies are available upon request.